Тема в разделе "СКАМ", создана пользователем All-HYIPs.info, ноя 16, 2018. Наша компания занимается распределением (инвестициями) активов и обязательств (известными как элементы балансовой отчетности) по пространству и времени, часто в условиях риска или неопределенности. Финансы также можно определить как науку об управлении деньгами. Личные финансы могут включать оплату образования, финансирование таких товаров длительного пользования, как недвижимость и автомобили, покупка страховки, например. страхование здоровья и имущества, инвестирование и сбережение на пенсию. 15.11.18 15:24 Transfer Sent Payment: 60.00 USD to account U17463730 from U1294xxx. Batch: 236097351. Memo: Shopping Cart Payment. Deposit to Daily Profit Pro Limited User allhyips. 03.12.18 06:54;Account;Receive;Received Payment 1.8 USD from account U17463730 to account U1294000. Batch: 238368624. Memo: API Payment. 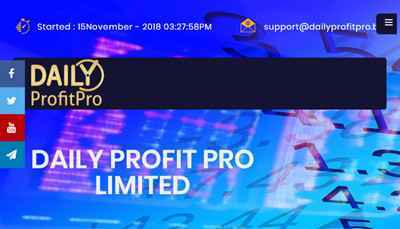 Withdraw to allhyips from Daily Profit Pro Limited. 02.12.18 05:26;Account;Receive;Received Payment 1.8 USD from account U17463730 to account U1294000. Batch: 238268020. Memo: API Payment. Withdraw to allhyips from Daily Profit Pro Limited. 04.12.18 05:19;Account;Receive;Received Payment 1.8 USD from account U17463730 to account U1294000. Batch: 238473958. Memo: API Payment. Withdraw to allhyips from Daily Profit Pro Limited. 05.12.18 05:22;Account;Receive;Received Payment 1.8 USD from account U17463730 to account U1294000. Batch: 238587939. Memo: API Payment. Withdraw to allhyips from Daily Profit Pro Limited. 06.12.18 04:50;Account;Receive;Received Payment 1.8 USD from account U17463730 to account U1294000. Batch: 238692512. Memo: API Payment. Withdraw to allhyips from Daily Profit Pro Limited. 07.12.18 04:29;Account;Receive;Received Payment 1.8 USD from account U17463730 to account U1294000. Batch: 238797437. Memo: API Payment. Withdraw to allhyips from Daily Profit Pro Limited. 09.12.18 04:42;Account;Receive;Received Payment 1.8 USD from account U17463730 to account U1294000. Batch: 238989004. Memo: API Payment. Withdraw to allhyips from Daily Profit Pro Limited. 08.12.18 04:51;Account;Receive;Received Payment 1.8 USD from account U17463730 to account U1294000. Batch: 238899137. Memo: API Payment. Withdraw to allhyips from Daily Profit Pro Limited. 10.12.18 02:33;Account;Receive;Received Payment 1.8 USD from account U17463730 to account U1294000. Batch: 239074865. Memo: API Payment. Withdraw to allhyips from Daily Profit Pro Limited. 11.12.18 06:35;Account;Receive;Received Payment 1.8 USD from account U17463730 to account U1294000. Batch: 239202474. Memo: API Payment. Withdraw to allhyips from Daily Profit Pro Limited. 12.12.18 05:18;Account;Receive;Received Payment 1.8 USD from account U17463730 to account U1294000. Batch: 239308997. Memo: API Payment. Withdraw to allhyips from Daily Profit Pro Limited. Скам. Сайта уже нет - он недоступен!